The raises for 44 nonunion employees include pay hikes of about 30 percent for the president and vice president. Suffolk Regional Off-Track Betting Corp., in bankruptcy since 2011, gave $511,506 in raises to nonunion employees this year, including pay hikes of about 30 percent to each of its top two employees, records show. The agency is flush with revenues from its new video lottery casino in Islandia but still owes creditors $13 million, according to OTB officials. OTB president Phil Nolan’s $45,500 raise brought his salary to $197,500, while vice president Anthony Pancella III’s salary increased by $45,000, to $187,500, according to documents obtained by Newsday under the Freedom of Information Law. In total, 44 of the betting agency’s 51 nonunion employees received raises in May ranging from 2.75 percent to 55 percent. The raises boosted the average compensation for those who got raises from $66,759 to $78,384, the county records show. Nolan said exempt employees hadn’t had raises in at least six years, and in some cases in as many as 10. He noted the employees must pay a portion of their health care costs and have had more work since Jake’s 58 casino opened in February 2017. “It’s more than fair they be awarded just compensation for the work that they do,” said Nolan, a former Democratic Islip Town supervisor. Some Suffolk County lawmakers questioned the pay hikes. Nolan and Pancella, the Baylon Republican chairman and vice chairman of the Suffolk County Republican Party, run the day-to-day operations at OTB. Suffolk political parties share patronage at the organization under an informal power-sharing agreement, leaders said. Some lawmakers called the raises excessive at a time when OTB is still in bankruptcy, and for a public benefit corporation whose profits are supposed to go to offset county taxes. Assemb. Michael Fitzpatrick (R-St. James), called OTB a “patronage mill . . . for an organization that is as deeply in debt as it is, maybe they should be out of bankruptcy before raising their pay.” Fitzpatrick noted that the higher pay will boost employees’ pensions when they retire. At Nassau Regional Off-Track Betting Corp., with 15 nonunion employees, president Joseph Cairo has not given raises since he took over in 2010, although three employees received pay increases for promotions or taking on additional duties since then, spokesman David Chauvin said. Payroll records show none of the exempt employees got raises between 2017 and 2018. Cairo, also the Nassau Republican chairman, has earned $198,000 a year since 2010. The second-highest paid employee is Arthur Walsh, general counsel and secretary to the board, who makes $155,000 a year, Chauvin said. OTBs were established to pass along profits from horse betting operations to local governments and cut down on illegal wagering. But as racing’s popularity has waned, OTB finances have suffered. New York City’s OTB shuttered in 2010. Suffolk OTB hasn’t turned a profit from horse race betting since 2006, and Nassau OTB hasn’t been profitable since 2008. Suffolk OTB filed for bankruptcy protection in 2011, with $17 million in debt. Nassau OTB has $8.8 million in debt, but has avoided bankruptcy. Under state legislation passed in 2013, the Nassau and Suffolk OTBs were allowed to open casinos with video lottery terminals, which are similar to slot machines. Suffolk OTB is operating its full complement of 1,000 machines at Jake’s 58. Nassau OTB has 505 dedicated VLTs at Resorts World Casino at Aqueduct Racetrack, which is operated by Genting New York LLC. Genting says it expects all 1,000 Nassau machines to be operating by spring 2019. The three-member Suffolk OTB board, who are appointed by the county legislature, awarded the raises to Nolan and Pancella at their May board meeting, while Nolan and Pancella approved the raises for the other exempt employees. Pancella said the raises do not need approval of the bankruptcy court. Nolan said he did not seek a raise, but appreciated the board’s recognition for successfully opening the first video lottery terminal casino on Long Island. “I’m very proud of what Tony and I have done here. This is nothing short of a real struggle and a battle. Not only did we survive, we’re prospering,” Nolan said. Pancella noted that the opening of Jake’s 58 preserved 250 OTB jobs and allowed the hiring of another 180 OTB employees at the casino. Eddie Wynn, chairman of the Suffolk OTB board and a Babylon Democrat, credited Nolan and Pancella for saving OTB. Suffolk OTB has seen better-than-expected revenue from Jake’s 58, which is operated by Delaware North, a privately held company based in Buffalo that manages venues, including casinos, worldwide. Year-to-date casino profits, before debt service, were $8.8 million through March, about 30 percent more than projected, according to minutes from OTB board meetings. Under the bankruptcy agreement, Suffolk County received monthly payments totaling $2 million from August 2017 through February, and expects to receive $300,000 a month for the next 10 months. The casino then is scheduled to pay the county $1 million a year for years three to 10, until creditors are paid off. Nolan said the $17 million owed to creditors has been paid down to $13 million, although Suffolk OTB also took on about $40 million in debt to convert the former Islandia Marriott Long Island into Jake’s 58. 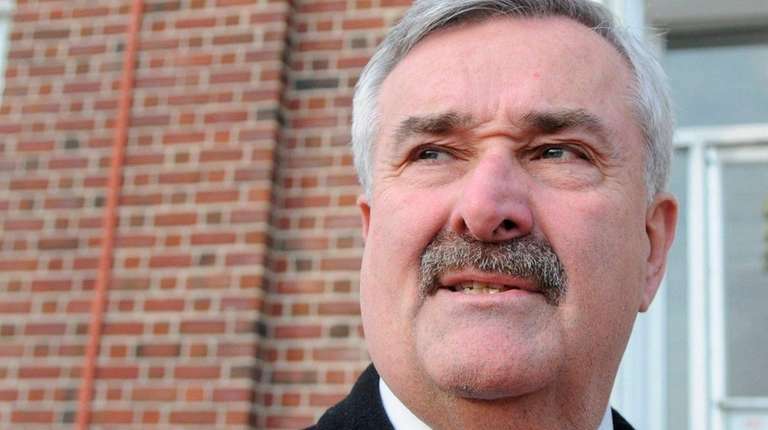 Suffolk political party leaders, while acknowledging OTB is staffed with political hires, said the raises for the management employees were deserved after years of going without. The county legislature passed a bill in December that earmarks a portion of Suffolk’s share of casino profits to provide public funding for candidates for county legislature and county executive. Suffolk OTB also is fighting a lawsuit filed by casino opponents that seeks to shut down the operation, arguing it was approved illegally by the Village of Islandia. A state Supreme Court justice ruled in September that village officials erred last year when they granted a permit for Suffolk OTB’s casino at Jake’s 58 hotel. The Islandia Village Board changed the village code to allow gambling facilities in hotels in November. The case has been moved to federal bankruptcy court in Brooklyn, according to Paul Sabatino, attorney for the plaintiffs.